As longtime Warsaw residents, Roma and the late Robert Maish believed community pride and "just being part of the community" to be reason enough for using the Kosciusko County Community Foundation as a conduit to help improve their hometown and the lives of the people who live here. Mr. Maish was a born-and-bred Warsaw native, and Mrs. Maish has lived here since she was in high school. Mr. Maish was the former president of Little Crow Foods, following his father into the business, then called Little Crow Milling Company, founded by his grandfather. He joined the company after returning in 1946 from serving in the Army Corps of Engineers in World War II. At Little Crow, he worked his way from the bottom up, learning all facets of the operation. The Maishes raised four children and had several grandchildren. Three of those grandchildren attended Warsaw Christian School. 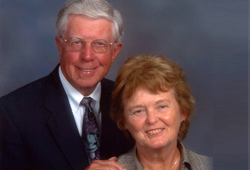 Mr. and Mrs. Maish attended Grandparents' Day there for several years and were so impressed with the school and the students that they established scholarships through the Foundation for children who are unable to pay to attend Warsaw Christian School and Lakeland Christian Academy. But the Maishes' generosity didn't stop there. Mr. Maish was an avid gardener, and the couple had seen some spectacular gardens in their travels to Hawaii and Europe. Thinking a garden would be a nice addition to Warsaw's Central Park, they not only established the Maish Gardens but also instituted an endowment through the Foundation that will provide for the gardens to be maintained in perpetuity through a committee that works under the auspices of the Foundation.